Week 2 came around as quick as you could say “Pole Fitness”. The bonus was that my upper body had recovered well; the bad news…I pulled a muscle in my neck which was really REALLY sore! That and a sore finger which I have had for the past 2 weeks! It seems to me that an athlete never has a well week! 1. Nothing was easy. I asked my teacher Christina if we were expected to pull off a flawless dance routine at the end of the 5 weeks. I felt reassured when she informed me that everyone repeats the course 2 or 3 times before they move onto Intermediate 2. Phew! 4. Hard work = sweat. Sweat = no grip on the pole. 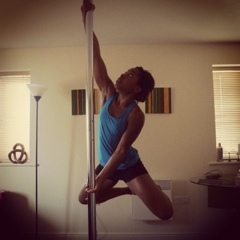 No grip on the pole = hard to do anything! I’m an avid user of hand cream which I think does not help. I have been told that my hands will sweat less as time goes on, and I try very hard not to rely on grip products. I have a copy of the routine so I can practice in between classes and I see that next week we will be moving onto the next part of the routine which includes handstands!